According to the philosophy of Jeff (Jason Segel), everything is connected and every coincidence is a meaningful sign from the universe. So what then does it mean that both Seigel and his I LOVE YOU MAN co-star Paul Rudd had films released within a year of each other in which they each played the pothead black sheep of a dysfunctional family who turns out to have more wisdom than you might think? Maybe if Robert Anton Wilson or Carl Jung were still alive they could find some profound significance in it all, but I'll just stick to reviewing the movie. Like Rudd's OUR IDIOT BROTHER, JEFF, WHO LIVES AT HOME is by today's comedy standards about as gentle and nice as they come. So is its main character, Jeff. 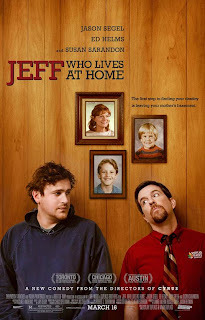 I imagine most people have known guys like Jeff; still living at home in their parent's basement, still waking and baking, still aimlessly adrift in the adult world, but by no means bad people. When Jeff answers a wrong number looking for a “Kevin”, he takes it as yet another sign. While riding a bus to Home Depot and entrusted with the seemingly simple task of buying some wood glue by his widowed mother (Susan Sarandon), Jeff sees another passenger wearing a jersey emblazoned with the name, you guessed it, Kevin. Rather than follow through with his assigned task, Jeff gets off the bus with this passenger. That eventually leads him to embark on a series of misadventures with his outwardly more successful though just as maladjusted brother Pat (Ed Helms) who is having difficulty in his relationship with wife Linda (Judy Greer). Meanwhile, Mom discovers she has a surprising secret admirer at her office. It's all pretty lightweight, banal stuff, and the film's examination of synchronicity (Jung's term for meaningful coincidences) feels watered down and facile, even for a comedy. I'd recommend seeing Paul Thomas Anderson's excellent MAGNOLIA for a much better rumination on those themes, although some folks can't get past that film's rain of frogs. Nonetheless, there are a fair number of laughs, and there isn't a mean bone in this movie's body. Segel's pothead portrayal feels natural, and unlike Rudd in OUR IDIOT BROTHER he comes across as more lost than clueless. Sarandon is fine, too, although there's so little connection between her storyline and the brothers' that it almost seems like two different movies. Helms is funny, but whether it's his performance or the writing, his character feels a bit too over the top. The direction by brothers Mark and Jay Duplass is, like their script, best described as serviceable. 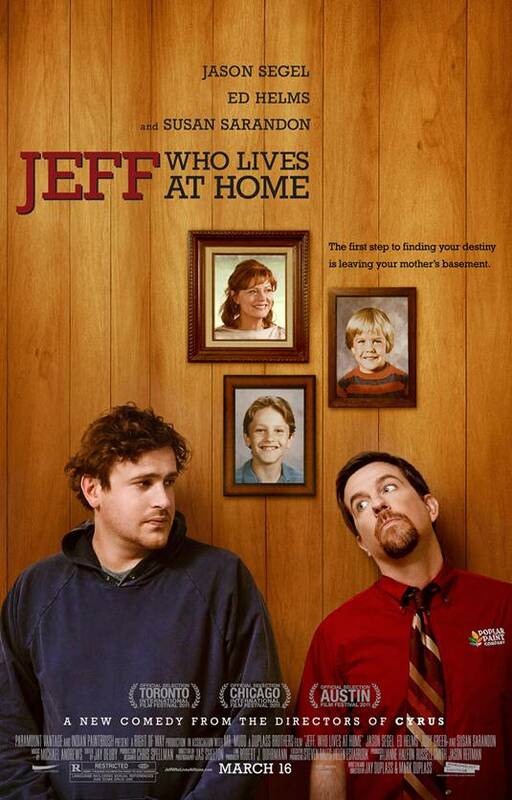 I can't say I thought JEFF, WHO LIVES AT HOME was a good movie, but at the same time I can't really bring myself to tear it apart. The nonjudgmental portrayal of marijuana use and some sexual themes and language may bother a few viewers, but compared to stuff like THE HANGOVER and BRIDESMAIDS, this is practically a family film. No doubt many people will like it just fine, being perfectly content to have a few good natured laughs and then move on with their lives, the memory of what they've seen fading the moment they walk out the theater door. 2 1/2 out of 4 stars.